I went into this film with very little knowledge... like I enter all things, with very little knowledge... I only knew that it was a revenge tale, that the director had cashed in his wifes retirement to pay for it and Sundance who had initially rejected the film later went on to say that rejection was a mistake. Those scrappy underdog stories always capture my imagination but its seldom the films live up to the folklore that builds up around them. Blue Ruin not only lives up to the lore, it transcends it. You will forget about the stories surrounding the making of the film/release of the film and accept the movie for what it is, a masterpiece. This is an honest look at revenge. We all like to imagine if we set out on a path of revenge we would react and act like Liam Neeson in Taken but the truth is most of us would act like Dwight in Blue Ruin. We would make mistakes and hurt the wrong people, leave behind evidence and do countless other things that would never make the cut in a Luc Besson picture. I'm not sure that giving away the plot details of this film would have any impact on your enjoyment but because it is so sparse when it comes to plot I'll avoid revealing anything more than I already have. Just know that this film is raw and at times brutal in its execution. The film is also a testament to how far digital film making has come. 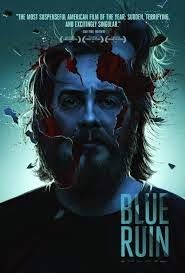 Blue Ruin was made on a shoestring budget but it looks very polished. Ten years ago a film made on this budget would have looked far worse. We are in the middle of an independent film renaissance and film makers like Jeremy Sauliner are reminding us that not all films need to be retreads of tired subjects, that directors and writers with unique voices should be celebrated and supported.